Controlled Chaos: If we get 25 followers. . . . . . If we get 25 followers. . . . . . I'll Make one of these CUTESY PATOOTSY clipboards personalized with your name on it. .
Why do I want 25 followers? Because, I'm hoping that somebody will "pay it forwards" and join with me on this resolution. . . and make it a lifestyle of giving!! Refer me to your friends!! One lucky winner will get a clip board! 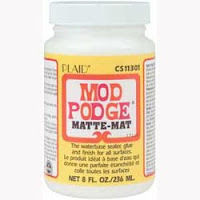 Add the ribbon and whatever embellishments using the ModPodge. . . When you have everything where you want it, simply ModPodge OVER everything - it leaves it with a glossy shine once finished and protects it from any spills or anything! 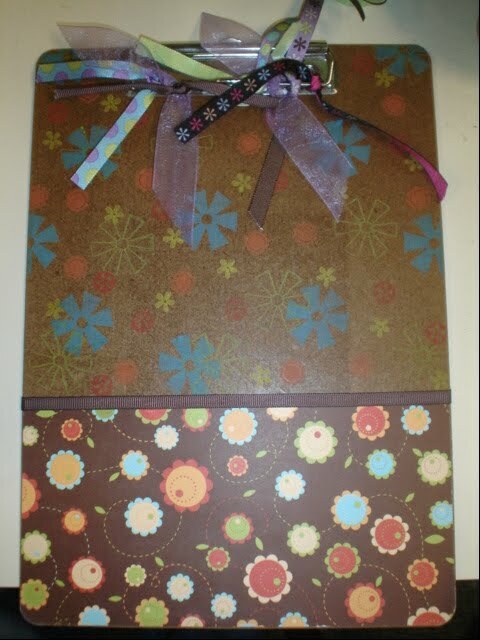 Add coordinating ribbon to the top! Your possibilities are endless!! It's cute if you make a little pencil with matching paper and ribbon!! I wanna know how to do this!!! I'll do better. .. .
3rd Snow This Year. . . . > WHAAAAAAAAAAT? I'm just a follower of Christ trying to do what He called me to everyday. Right now, that includes being a mommy to three extremely cute but mostly out of control people under 4 and loving their daddy more than anything else in this world!! I also work for a FANTASTIC store called Green Livin' where we grow and sell our own organic produce - it's so much fun!!! Oh yeah, and on the side, I work at Longhorn Steakhouse at nights wish some pretty awesome folks!! !